You know how we're an art family...: WIP Wed & happy autumn! You may remember that this has been sort of a WIP that has lasted many months, but I'm working on making each of the boys a pair of felted slippers. Finn's and Paulie's were finished a while ago, but I had yet to make Philip a pair. Felting can be such a tricky thing. They never turn out exactly how I think they will, which is part of the charm, I guess. 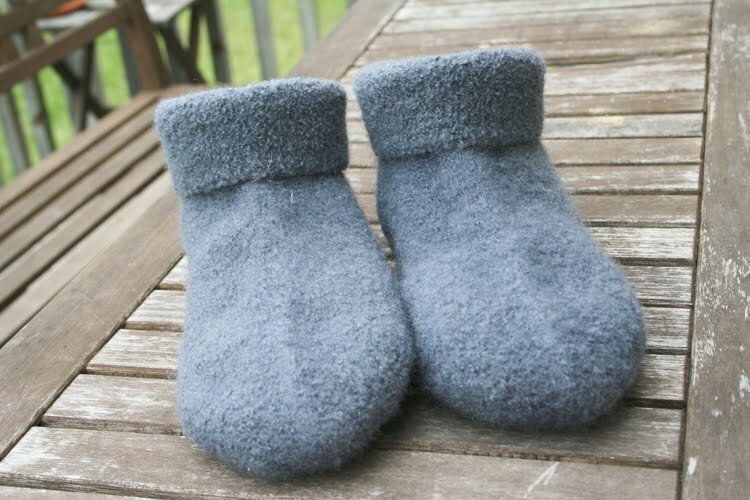 I made these gray slippers just a bit smaller than Paulie's since, despite the fact they are 3 years apart in age, Philip is only slightly smaller in size than Paulie. Well, somehow they turned out a bit bigger than Paulie's pair; they actually fit me! So...I think I may switch the buttons/decoration on their pairs and give them each a little bit of growing room. Philip's obsession with Legos in mind, I decided to find a way to make him a pair of Lego slippers. I realize the contradiction in attaching a little plastic decoration to a nice pair of felted wool slippers, but I'm willing to overlook a wee bit of contradiction for a pair of slippers that will be well-loved and hopefully well-worn. Enter the button shanks, left over from Elizabeth's rainbow bag. 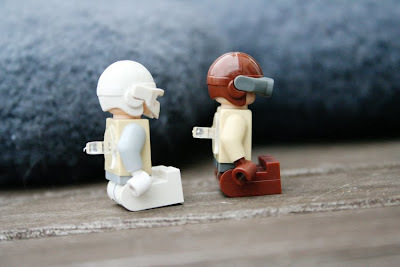 I glued those little suckers on the back of 2 Lego men and now we have Lego buttons. The best part of this fabulous idea, in my humble opinion, is that the button shanks are only attached to the torso on the men which means that Philip can switch out heads, glasses, hats, pants, or anything else he desires when he wants to give his slippers a bit of a new look. 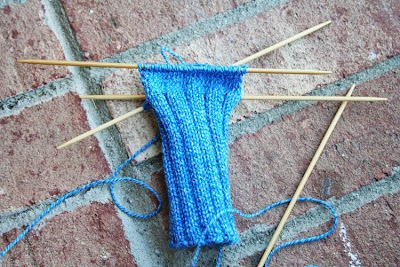 Since my socks came off the needles, I decided to start a new pair of socks for Finn using Panda Wool yarn (which has been discontinued since I purchased it). I love the slight blue/white varigation and think these will be sturdy, warm socks for the fall and winter. Have I mentioned how much more quickly I can knit his small socks? New posts up at The Book Children! I love to see how you repurposed those shanks. What a brilliant idea. We love Legos around here, too. The Lego buttons are fantastic! Such a great idea. And I love your new socks. Gorgeous! OMG Joy...you are AWESOME! I love those socks and the Lego buttons?? Well, you have outdone yourself. That is FABULOUS!! wow! I dont know what else to say but wow! I love those buttons. Sometimes it's the little things, isn't it? Your socks are great and I love the colourway. I also really enjoy ribbed socks. As far as hand knitted socks go I think they work much better than the plain ones. 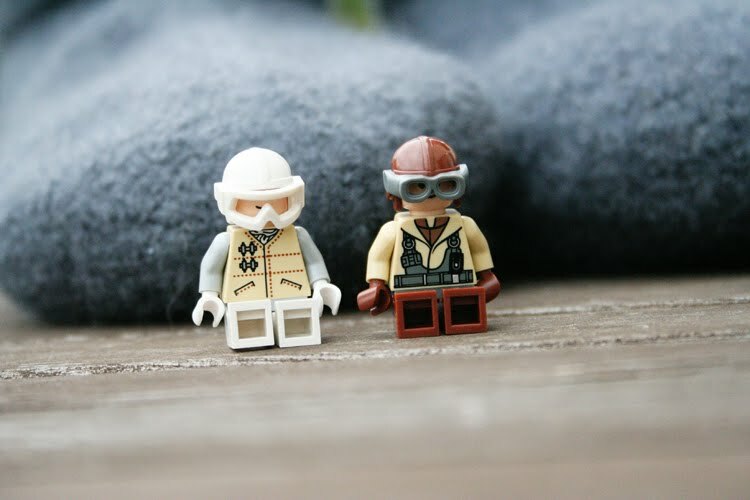 What are those Lego buttons? Too cute!